Why walk (and get shot) when you can drive (and get shot)? 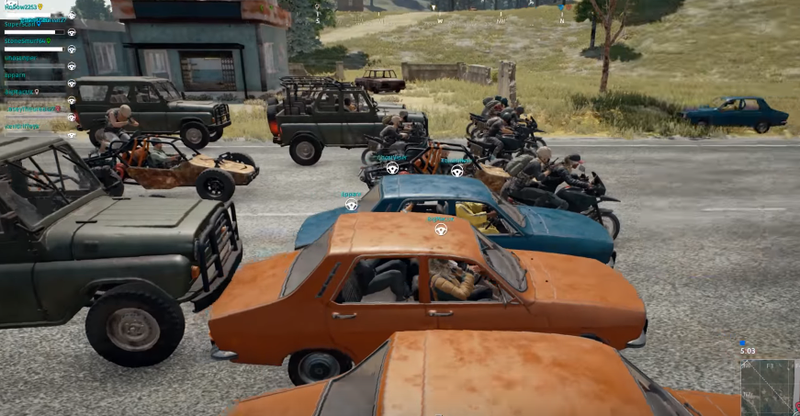 It’s a question both asked and answered by a group of PlayerUnknown’s Battlegrounds players who’ve started staging huge vehicular death races around the island. StoneMountain64 posted a video compilation of death racing antics, and they’re wild. The basic setup is as follows: squads of players clamber into cars and bikes during a match’s first five minutes. Then they gather at a starting line near the southernmost point on the map. Players can shoot each other, but only after they’ve made it across the first bridge, and only with pistols. Beyond that, anything goes. If your car flips and explodes, you can find or steal another. You can also get out of your car and set up roadblocks. If you’ve ever watched beloved 1960s children’s cartoon Wacky Races, it’s pretty much exactly like that, except with permadeath. It leads to some great moments, like when StoneMountain loses his co-pilot and tries to make a mad dash across the final bridge, only to get his tires (and eventually, brain) blown out by campers. It’s also just generally hilarious to watch people try to jostle for position and make tight turns in PUBG’s cars, which are prone to cartwheeling like they’re trying out for the US Olympics gymnastics team. Speaking of, how long until a custom mode that’s just car gymnastics? I’d play that.